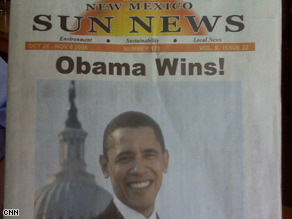 A New Mexico paper has declared Obama the winner. SANTA FE, New Mexico (CNN) – For The New Mexico Sun News it is either a major scoop or “Dewey Beats Truman” déjà vu 60 years later. And they wonder why readership is down to the lowest levels in history. Liberal paper editors and supposedly unbiased journalists with outright biased reporting without any relevant facts. I hope the socialist taxes the hell out of this paper and all its union members remeber this day in particular when they are out on their tails with no job. 282 Obama to 256 McCain. Mark my word. No landslide but enough. Don't let the Republicans steal this one. Get out there and VOTE IN OVERWHELMING, UNQUESTIONABLE NUMBERS!!! Are you blaming the Democrats? Probably. Your party lost it's way and has shamed this country and you want another Republican in office? NOT THIS TIME!!!. No!!!! This was an extremely poor choice in judgment. If this paper truly supports Obama they should've known this could possibly jeopardize his chances. Listen, everyone, no matter who you support...go out and vote! That is all that matters right now. Too bad that they could not wait. Now Obama will be blamed and McCain will probably say that Obama owns the paper. "Dewey Wins" was the headline in 1948, held up by the real winner Harry Truman. The more things change, the more they remain the same. It ain't over till it's over. VOTE! Obama/Biden '08. Spit over your shoulder and get out to vote obama!! The difference is that Dewey lost to Truman. I'm pretty sure the Sun News got this one right. half of my income is going to be gone 😦 and I'm not rich. just look at canada and much of europe – does anyone really think obama, pelosi, reid, dodd, frank, franken – are going to stop until half of our income is taxed away to social programs and hand-outs. i'm thinking of moving to another country. no point in working hard here in america anymore. It´s not because of his speech, it´s because of truth. Anyway you win only the moment you win !!! OBAMA HAS NOT WON YET !!!!!! REMEMBER THE 2000 ELECTION !!!!!!!!! GO OUT & WORK & VOTE & GET OTHERS TO VOTE. WHAT YOU ARE DOING IS NOTHING BUT CENSORSHIP!!!!!!! I have taken election day off work to help others get to the polls. Do what ever you have to do to make change happen.